Falmouth, ME–(ENEWSPF)–March 10, 2017. 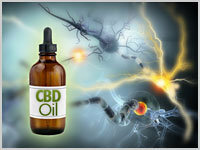 The administration of whole-plant cannabis extracts rich in the cannabinoid cannabidol (CBD) is associated with reduced seizure frequency in patients with refractory epilepsy, according to data published online ahead of print in the journal Epilepsy & Behavior. Researchers performed a retrospective chart review of the clinical records of 272 patients who were taking whole-plant CBD extracts. Eighty-six percent of those treated observed some clinical benefit (a reduction in seizure frequency) while ten percent experienced a complete clinical response. The remaining patients were either not responsive to treatment or reported an exacerbation of seizures during therapy. Beneficial side effects, such as improved mood, better sleep quality, and increased appetite were reported. Full text of the study, “The current status of artisanal cannabis for the treatment of epilepsy in the United States,” appears in Epilepsy & Behavior. Additional data regarding the efficacy of cannabinoids as anticonvulsants appears in NORML’s library.